I love walking in nature. It gives us so much to consider, about life and the inhabitants of this world, from the tiniest living organisms to the unexpectedly largest creatures we encounter. I believe that if we look closer, and use all our senses to appreciate the beauty, we learn a lot about ourselves. Recently I walked down the Carlo Sandblow on Rainbow Beach in The Great Sandy National Park and spent some time taking in this amazing place. 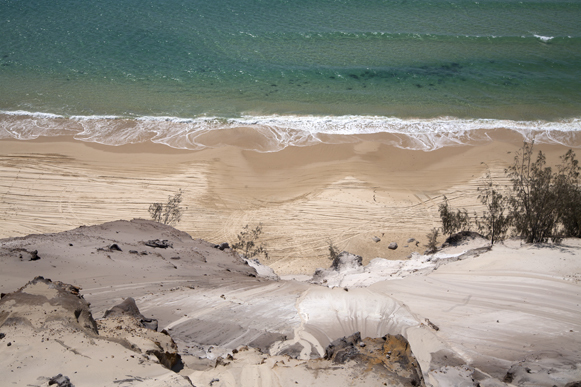 It was named by Captain Cook, after one his crew, so an unusual name for such a beautiful place. The real photos came from a walk to the cliff edge and pointing the camera down the slope. It was a little nerve racking even though I was leaning against solid rock. With the wonders of the internet now allowing us to visit this sandblow from anywhere in the world, I have to say you cant beat the experience of being there. It always amazes me how the elements create such beautiful patterns and I try to capture them wherever I go. I do believe our childhood memories influence our choices, especially the way we create art. The sea runs in my blood, compliments of my professional fisherman father who allowed me grow up on an island. Although he died over thirty years ago I still use my father’s wisdom in dealing with the elements. Of all the values I uphold, the wilderness teaches me that freedom is one of the most important. Being blessed and incredibly grateful to be born in a free country like Australia, a place where opportunities are there if you choose to work for them, allows me to travel and create the art that is in my heart. I intend to do this with a passion for some time yet with Cape York in my sights next year.